Indian Skimmer is listed as a ‘Vulnerable’ species on the IUCN Red List but its population is undergoing a rapid decline due to widespread degradation and disturbance of lowland rivers and lakes. India holds the only known remaining breeding grounds for this species and the National Chambal Sanctuary (NCS) is one among very few locations in India that hosts significant breeding populations of Indian skimmer. Research attention on this species has been focused almost entirely on very basic natural history observations, and major gaps in even basic habitat requirements of the species persist. Several new dams and water extraction devices are scheduled to be set up at the Chambal River potentially complicating the management of the sanctuary for target fauna. Information on habitat use and preference; the effects of habitat attributes, biotic factors and human disturbances on Indian skimmer distribution and abundance are either scant or completely lacking, and thus are an impediment to effectively understand the conservation needs of the species. 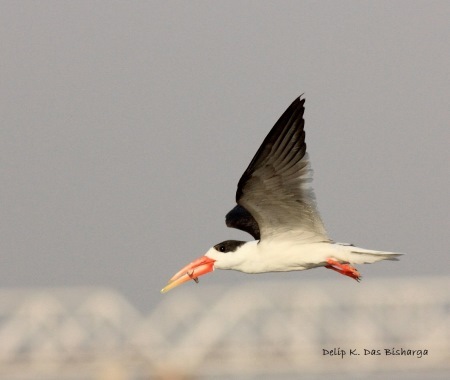 This study aims to identify the important nesting sites, as well as understand the ecological and anthropological factors influencing the nesting habitat selection of Indian skimmer in NCS. The results of this study will go a long way in helping establish practical management protocols for the NCS.